El col·lectiu Korean Club organitza un segon Intercanvi Gastronòmic entre Corea del Sud i Espanya. L’activitat es realitzarà el dijous dia 24 d’octubre al Centre de Recursos per a Col·lectius de la UAB. Korean Club és un col·lectiu molt actiu dins el teixit associatiu de la UAB que està format per amants de Corea, de la seva cultura, el menjar i les tradicions, així com també de l’estil musical K-POP. La finalitat de les activitats que proposen és endinsar als participants dins la cultura sud-coreana, i per altra banda, aprofitar l’oportunitat per a generar un intercanvi cultural amb els estudiants coreans de la universitat. Davant l’èxit del primer Intercanvi Gastronòmic, el col·lectiu ha volgut repetir l’experiència. Aquesta vegada, l’esdeveniment del dia 24 es dividirà en dues grans parts. 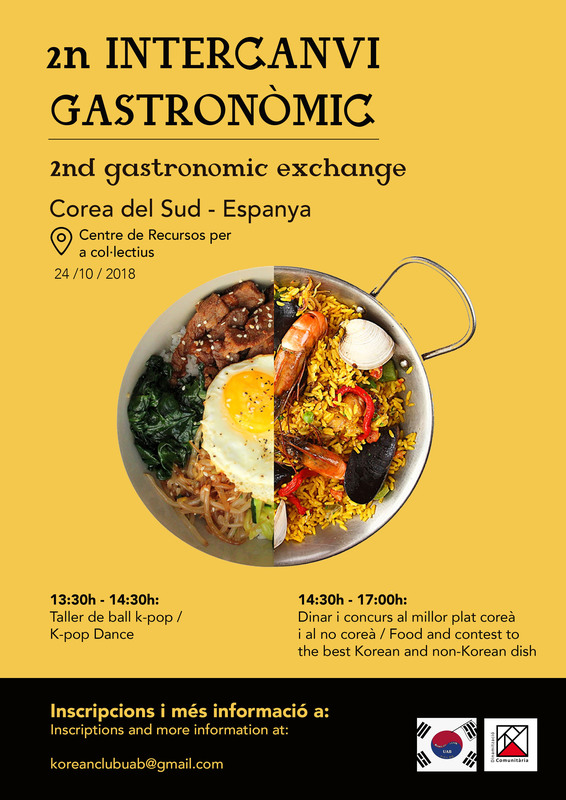 De 13.30 a 14:30 h es realitzarà un taller de ball K-Pop, i després, de 14.30 a 17:00 h començarà un dinar amb menjars típics de cada país i un concurs al millor plat coreà i espanyol. Les persones guanyadores de cada modalitat rebran un premi, els guanyadors del plat coreà se’ls hi farà entrega d’una cistella de productes espanyols, i als guanyadors al millor plat espanyol rebran una cistella amb productes coreans. The Korean Club society is organising their second Gastronomic Exchange between South Korea and Spain. The activity will take place on Thursday October 24th at the Centre de Recursos per a Col·lectius de la UAB. Korean Club is a very active society within the associative structure of UAB. It is composed of fans of Korea, its culture, food and traditions as well as the music style called K-POP. The aim of these activities is to introduce the participants into the South-Korean culture and, at the same time, create a cultural exchange with Korean students at university. The society wants to repeat the Gastronomic Exchange after the success that the first edition had. This time, the event on October 24th will be divided into two big parts. Firstly, there will be a K-Pop dance workshop from 1.30pm to 2.30pm and then, from 2.30pm to 5pm a lunch with typical dishes from every country will begin. There will be a contest for the best Korean dish and the best Spanish dish. The winners of each category will be awarded with a prize. The winners for the best Korean dish will get a basket with Spanish products, and the winners for the best Spanish dish will receive a basket with Korean products.